On one hand I can’t see them not going for the Munich bid, on the other hand what does it kick out? Or will they just extend the tour, like they’ve been doing for the last few reshuffles? RugbyLiebe wrote: So apparently the first decisions on the World Series tops for 2019/20 have been made. This article suggests that Hamilton, New Zealand won the right to host a tournament again, but they will have every second tournament in Fiji. It also means that the only Fiji bid failed. No word about the other stops. Not sure, what this means to the Munich bid. Where's the logic to that? I mean apart from your regular doomsday attitude? The HK tournament according to your "logic" is a fallacy as HK never even finishes at runner ups. 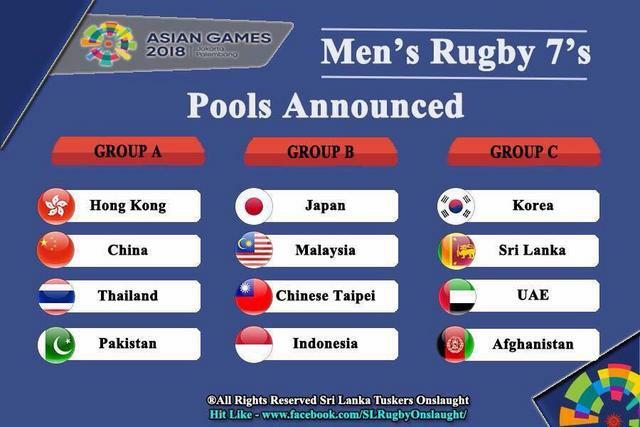 In its facebook page Mongolian federation seems affirming that they're going to play in these Asian Games. The Slaimankhels grew up in Auckland. Omar played for the NRL NZ Warriors and RU in Japan. Actually, his family has become an Auckland sporting dynasty. An uncle was a 100m sprint champion in Pakistan. His cousin Khalid is a champion bodybuilder and powerlifter preparing for the Australasian championships next month. His older brother Sabir has also been a competitive weightlifter and played premier rugby in Otago. Omar has four brothers, while Khalid is one of six, and almost all of them have played first XV rugby. I saw a story on TV about the Afghan team here in NZ. The 5 Slaimankhels brothers were training in Auckland before heading over to Indonesia, Rocky Khan ex NZ 7s player was helping coach them, they said the rest of the team doesn't know too much about rugby and have only been together for a few weeks. Afghanistan 36 - 0 UAE. Nice! UAE with only Emiratis, mixed or only expats? Emiratis. Apparently the Afghanistan squad outside of the Slaimankheks are new to the sport. La Fédération Burundaise de Rugby a le plaisir d’annoncer les résultats de deux matches très intenses de Rugby à 7 entre le Burundi et l’Ouganda qui ont eu lieu à Bujumbura du 25-26 Aout 2018. L’Ouganda a gagné successivement 44-7 pour le premier match et 51- 0 contre le Burundi pour le 2eme match. En effet, l’équipe burundaise de Rugby à 7 a pu se mesurer à cette grande équipe de calibre mondiale dans le but de préparer le tournoi de Rugby à 7, zone Centre, qui aura lieu à Bujumbura à la fin du mois de Septembre (29-30/9/2018). Ces matches s’inscrivent dans le cadre des Jeux de la Communauté Est Africaine (EAC), regroupant les pays: Burundi, Rwanda, Kenya, Uganda, Tanzanie et Sud Soudan. Huit sports dont le rugby ont été sélectionnés pour la première édition du tournoi des jeux de l’EAC qui a commencé le 16/8/2018 et se termine 30/8/2018. Kenya, Rwanda Tanzania and South Sudan didn't take rugby 7s teams to the games though, so it was a 2 team affair. Sorry, may you remind me which european teams are battling for a place in Hong Kong and how many spots are destined to them? 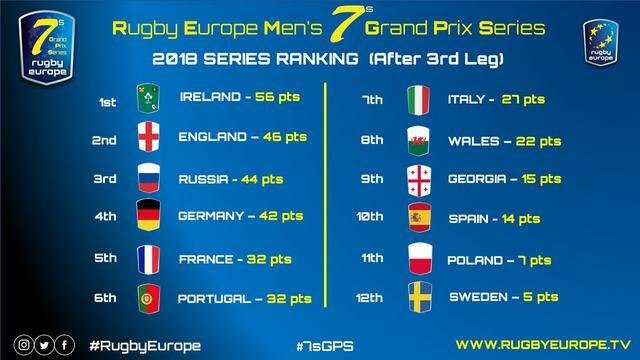 Italy and Portugal should come to play the South American Sevens Series. Germany just lost 14:15 against Russia. The timing by rugby Europe showed in the middle that 5:80 minutes (no, not a typo, 5 minutes and 80 seconds!) were played and a lets say the ref had a horrible day. Still deserved win by Russia due to the better 1st half, but especially simple things like time-taking and time-offs need to be made sure that they work. This looked like pure amateurs all around. Ireland just needs to beat Sweden to conquer the continental crown, I think; but Sweden desperately needs to pass the quarterfinals to keep some hope to not be relegated. Georgia is already relegated, if I'm not wrong, with the second team going down on Trophy to be picked up between Spain and, indeed, Sweden. and be seeded Number 1 for the 2019 Trophy Tournament. maybe the confusion is based on the fact that in Women Rugby two are being relegated.